Dimeric disulphide Schiff bases were synthesized via reactions of 2-aminophenyl disulphide with various aromatic aldehydes under reflux and prepared nano‐sized cerium oxide as catalyst. It observed that, when nanocatalyst were used, the catalyst could be reduced the reaction time and increased yields compared with the none-catalyst conditions. Moreover, the CeO2 nanocatalyst were easy preparation, non-hazardous, eco-friendliness and low cost. The morphological features of CeO2 nanocatalyst were characterized by X-ray diffraction (XRD), scanning electron microscopy (SEM), energy dispersive X-ray (EDX), but also ligand structures were investigated some techniques such as fourier transform infrared (FT-IR), nuclear magnetic resonance (NMR) spectroscopy and thermogravimetric analysis (TGA) / differential thermal analysis (DTA). This research was supported by (Project No: 2014-05-03-259 and 2015-05-03-354) from Duzce University Scientific Research Fund (BAP). ISNAD Durmuş, Sefa , Dalmaz, Aslıhan , Özdinçer, Mesut , Sivrikaya, Sezen . "Preparation of Cerium Oxide Nanoparticles: An Efficient Catalyst to the Synthesis of Dimeric Disulphide Schiff Bases". 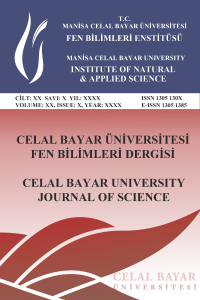 Celal Bayar University Journal of Science 13 / 1 (March 2017): 25-30.